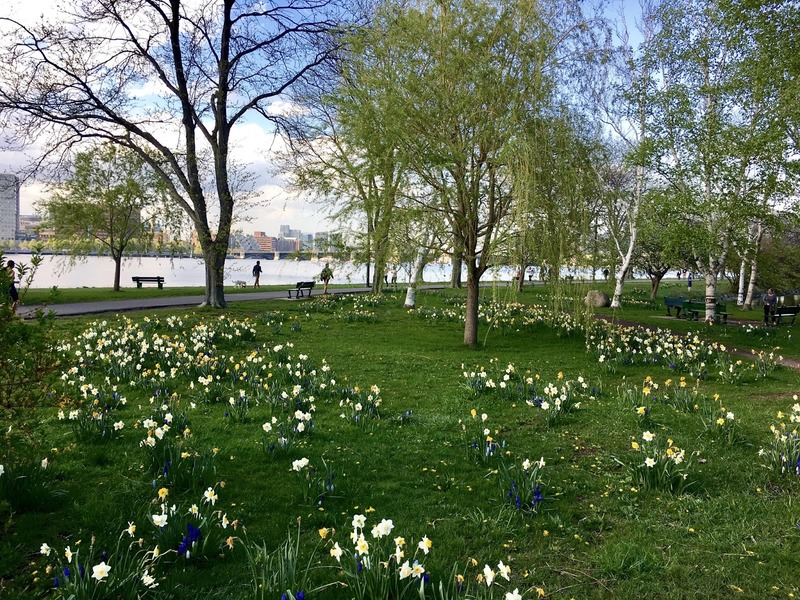 It’s the little things, like the first signs of spring, that can instantly add pep to your step. When I wake up, I open the windows wide, let the breeze flow in, tie up my sneakers and run around the daffodil and lilac lined streets of Cambridge to the Charles River. These runs rejuvenate my morning as I head into the city to start the day. Instead of cooking breakfast after my morning jogs, I save time by prepping the night before. I’ve been obsessed with overnight oats lately. 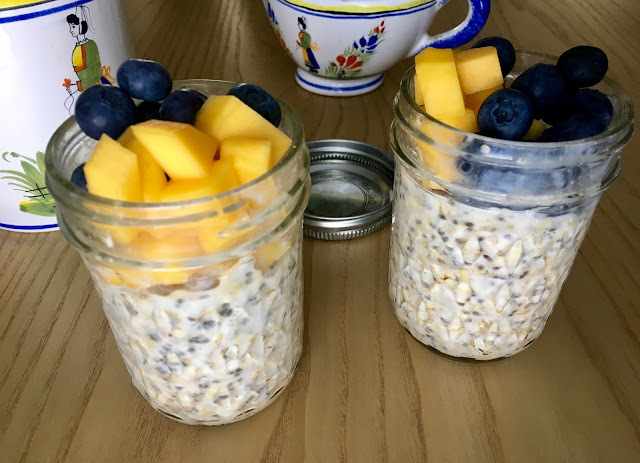 I line up a few mason jars, stir together oats for heartiness, chia seeds for a burst of energy, sliced almonds for protein, agave for a touch of sweetness, and almond milk for calcium. I screw the lids on the jars and head to bed. 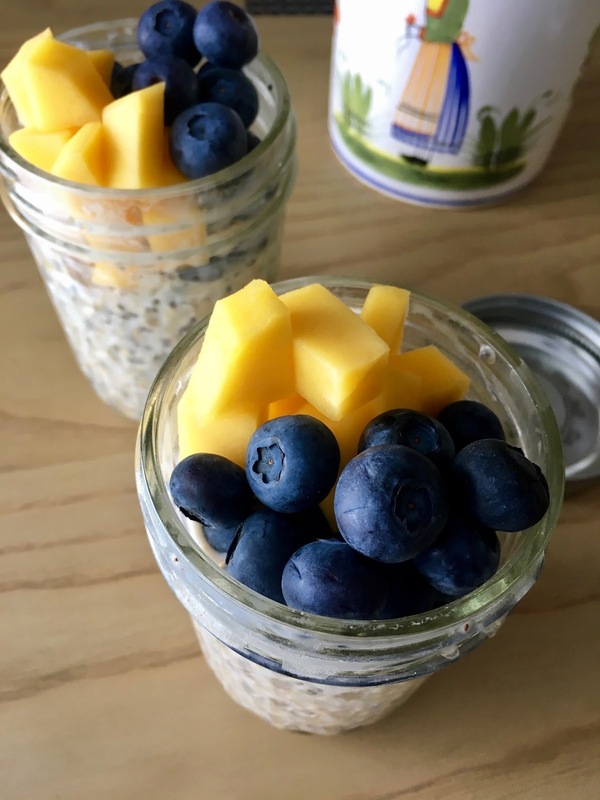 The next day, I pop one open, give the pudding-like oats a stir, and top with a colorful sprinkle of antioxidant-rich blueberries, Vitamin C-rich mangos, or whatever fruit I have on hand. These make-ahead morning meals are simple to prepare, satisfying to get you through to lunch, and oh so pretty! In a mason jar or vessel of your choice, add the oats, chia seeds, almonds, cinnamon, honey/agave, salt and milk. Stir to combine. Cover and refrigerate for at least 3 hours or overnight. When ready to enjoy, remove the jar from the refrigerator and stir the porridge-like oats together. Sprinkle the cubed mango and blueberries on top and dig in. Makes 1. Have fun with toppings! I’ve tried banana, creamy peanut butter and dark chocolate; peach, spicy ginger and pecan; strawberry, salty pistachio and orange zest. If you’d prefer a warm start to the day, feel free to zap the oats in the microwave for 1 minute or so before digging in.